With Independence Day quickly approaching and while reflecting on the current state of this world as it relates to our freedoms, I am compelled to send you this timely message. Our world is becoming more surreal by the minute. Things that we could never have imagined are happening blatantly right before our eyes. The devil appears to be making headway like never before. At every crossroad we are losing our rights, the constitution is being ignored, and evil has been given a green light. At times I find it extremely difficult not to be angry, depressed, and hopeless. Then I remember what Jesus said, “These things I have spoken to you, that in me you might have peace. In the world you shall have tribulation: but be of good cheer; I have overcome the world.” (John 16:3 ) The fact of the matter is that this world system is passing away and the more deeply we are entrenched in it, the more hopeless we’re going to feel. God said for us to “be in this world, but not of this world.” (Romans 12:2) Yet even in this position, Jesus has given us kingdom authority in his name. He tells us to talk to our mountains and they must obey. I don’t believe God wants his children to be railroaded by the devil. He wants us to fight back, but in a way that’s going to garner results. We can’t fight the devil in the flesh or on his own terms. He’s too powerful for us, but NO match for the power of God living in and through us. I believe God does want us to get angry, but not at puppets parading around in front of us. He wants us to direct our anger at the culprits running the show. These include the evil powers, principalities, and the spiritual wickedness in high places. Hate of our fellow human beings has no place in the heart of a believer. Jesus said that he came not to the world to condemn it, but that through Him it might be saved. (John 3:17) I believe God wants us to pray for our leaders and not just for their destruction, but for their salvation. In fact he says, pray for our enemies and those who despitefully use us. (Matthew 5:44) Yes, I know this is easier said than done, but that doesn’t mean that we should not try, and if anything, ask God to give us the desire or power to do so. I am all for recalling and voting those out of office who appear to have no intention of representing the will of the people. However, we can only put so much faith in the political process as it continues to fail us time and time again. The levels of corruption are so stacked against us that only an act of God can save us now. The Bible says, “Not by might, nor by power, but by MY Spirit, says the Lord.” (Zechariah 4:6) If we are to win this battle, it’s not going to happen in our own strength. No, we must now put on the full armor of God and begin to pull down those strongholds, not in the natural but in the spiritual realm. We must bombard the throne room of God with prayer and petitions until God moves on our behalf! I heard a minister say yesterday in a sermon on YouTube, that the Lord told him that Christians in American are too self-centered to pray for their country. What do you think? Being honest here, there are many things I’d probably rather do than pray: listen to YouTube videos, cook, eat, and most definitely sleep. Yet I have this compelling pull in my heart that if I don’t start praying for change NOW, soon it will be too late, maybe in some cases it already is too late. Yet, for the sake of FREEDOM, salvation of the lost, and a relatively peaceful life, it’s time to enter into the throne room with God with all the fervor and tenacity that I have. The consequences of not praying just aren’t acceptable to me and if things don’t change at least I’ll know that it’s not for lack of effort on my part. Can I encourage you to do the same? We can be complacent no more. We must make God and prayer a priority in our daily lives like never before. Let’s not go down without a Godly fight! We can also fight by binding and loosing. Jesus said in Matthew 18:18 that “Truly I tell you, whatever you bind on earth will be bound in heaven, and whatever you loose on earth will be loosed in heaven.” Verse 9 declares, Again, truly I tell you that if two of you on earth agree about anything they ask for, it will be done for them by my Father in heaven. For where two or three gather in my name, there am I with them.” In the name of Jesus, we can bind the power of the enemy and if we do it in agreement with others, God said it shall be done. I’d like to bind the many different powers of the government and loose the power of God to set people free. I believe we should just start binding whatever is not of the will of God according to the scriptures! My church has intercessory prayer each week. I am purposing in my heart to pray with the saints as often as I can, as there is power in numbers. We all have different issues on our hearts. I for one am opposed to vaccine legislation that takes away a parents rights to control what goes into our children’s bodies. Vaccines aren’t the issue, liberty is what we stand to lose. Others may be passionate about the ruling of the Supreme Court making gay marriage a civil right. It could be climate change, ISIS, or racism. There is a long, long laundry list of issues to choose from. In fact, it’s pretty overwhelming. Ask God what he wants you to pray for and as a last resort, pray the Lord’s Prayer (Matthew 6: 9-13) that truly covers it all. If possible, see if you can band others together to pray as well. I understand that in the end times, perilous times are coming. It might not be realistic to believe that we will change every outcome, as some are just ordained by God and must come to pass for God’s plan and purpose to be fulfilled. However, that is a weak argument for not doing all we can, through the spirit, to get God on the scene. Even if we can’t change the outcome, we may be able to change its course. And at the very least, we can pray for those who need the Lord and are walking in spiritual darkness, that the eyes of their understanding are opened and enlightened and that the light of the glorious of gospel of God would shine unto them. Are their people in your family, job, or neighborhood who need the Lord? If so, are you committed to praying for them consistently? Just this week, I created a prayer vision altar board to remind me of God’s promises, and to encourage me to pray more often. 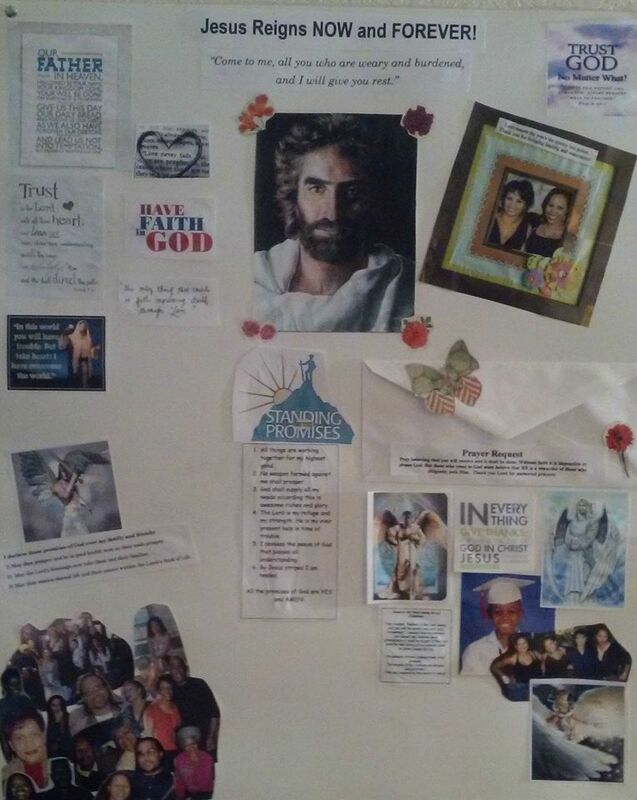 I posted pictures of those that I want to pray for and glued on an envelope to add my prayer requests. I also plan to add important issues that I want to keep before the Lord. If this is of interest to you as well, check mine out. My goal is to set a fixed time daily that I can pray and my altar is a great reminder in helping me to do this. I also feel it is powerful when we can visualize our needs and desires. Brothers and sisters, we are living in the last days. I believe things that we could never imagine are coming upon the earth. It is time for us to get about our Father’s business. I want to encourage you to, as much as you can, to take your focus off of yourself and this world, and put your attention on the Lord Jesus Christ. I want to encourage you to “look for” and to “prepare” for his coming. We all know the story of the 10 virgins, 5 were ready for the Lord to return and 5 were not. (Matthew 25) This is a critical time in history. We can no longer just fiddle around and allow the world to keep us distracted or asleep. Romans 13:11 declares, “And that, knowing the time, that now it is high time to awaken out of sleep; for now is our salvation nearer than when we first believed.” It’s time to wake up! It’s time to stand our ground, in love! It’s time to pray like we have never prayed before! Will you join me and others in this charge? Here is a beautiful and powerful prayer written by me and an awesome brother in the Lord for such a time as this. Let’s all pray this prayer in agreement. There is a serious lack of love today, Father God. The enemy who comes to kill, steal and destroy is a master at dividing people and conquering them. We are troubled by the horrific and evil acts that are taking place near and far in this sin-sick and dying world, some of which are done in the name of religion. There are murders, assaults, robberies, rapes, beheadings, massacres and numerous instances where the powerful oppress those who are powerless or defenseless. But you are omnipotent, all powerful, omnipresent, everywhere at once, and omniscient, all knowing. If we are troubled by the evil that pervades our world we know that you are saddened because you hate sin and sent your only begotten Son to die for our sins. Jesus said that there will be trials and tribulations but we can be of good cheer because He overcame the world. Your Word says “the Lord is near to the brokenhearted and saves the crushed in spirit.” We pray collectively Father God, in the name of Jesus, that You will be the advocate for the lost, the forgotten, the forsaken, the powerless. We pray that you will make yourself known to those who are crushed in spirit. We ask that you will please save those who don’t know you and watch over them as a shepherd watches over his sheep. Father God, in the Name of Jesus, we stand in agreement against the evil powers, principalities and the rulers of darkness that have taken this world captive. We pray in the name of Jesus, that your power will prevail and infuse every situation, law, and evil presence that is in opposition to your will and your way. We give charge to the ministering angels and the armies of the Living God to fight against and pull down every stronghold that exalts it’s against the heart of God. Your Word says that whom the Son sets free is free indeed. Father, help us to walk in the freedom that you have so liberally bestowed upon us. Not a liberty of the flesh, but a liberty from the lies and deceptions of this world and its ways that are leading so many to destruction. We bind every work of the enemy and loose your powers over the heavens and the earth. Father God, forgive us for our complacency in not praying for the lost, our leaders, our government, and our world. Forgive us for not standing for righteousness, but not through hate or coercion, but through the love and power of God that we have through intercession, prayer, and faith. Help us to recognize our true enemy, the devil, and in the mighty name of Jesus, put Him under our feet. We denounce every lie that pits us against one another. There is only one race and that is the human race. Help us to see our brothers and sisters how you see them, and instead of condemning, pray for those who need you most. We know there won’t be absolute peace in the world until Jesus returns at the end of time, but in the meantime, we pray that you will comfort those in need of comforting; be a father to the fatherless; a mother to the motherless and be closer than a brother to all who are desperate for you. We pray that you will motivate those who are in a position to help the poor and needy and that you will soften the hearts of leaders and law makers who can make a difference in governments around the world. We plead the precious blood of Christ over all who are hurting, oppressed and feel that no one cares. You love us all and I pray that you will show up and show out everywhere you’re needed in Jesus’ mighty name. Amen. Amen. Amen. If you enjoyed this article, please share it. Let’s get others fired up to pray as well! Please leave any comments below. Thank you, Rhonda, God bless and empower you as you speak out. Thank you for bringing to light what. Is going on. We. all need to put on the spiritual armor of God and pray. These are. the times and now is the time. To pray and be prepared. May God bless and keep you and us all. I feel you on this. This past week I have never sense such darkness like never before. And I am not sure if the body of Christ is ready for the battle! The battle for souls is at a all time high. Sometimes I just stand still and just observe people going on about life as usual. I ponder do they know where they will spend eternity? It can happen at any moment. So I pray that God make me ever more sensitive to the eternity of the souls I see, work with, talk to, each day. Lord Have Mercy.